We were here at the legendary roadside stall in 2011, and the queue remained as crazy in 2016… And the queue at the chendul stall opposite remained non-existent… Oops. This pushcart stall started in 1936 with the old Mr Tan Teik Fuang learning to make and beginning to sell chendul at Penang Road. Business flourished and picked up when the 2nd generation Mr Tan Chong Kim took over in 1977 and started applying innovation with a business mind while keeping the quality of the product. Today Penang Road Famous Teochew Chendul has branches all over Malaysia and is planning on expanding to overseas too. 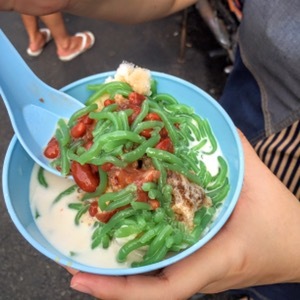 As usual, we just grabbed a bowl of Chendul for RM2.70, and slurped it up by the roadside, along with the rest.